Bern is an underdog. I mean it . 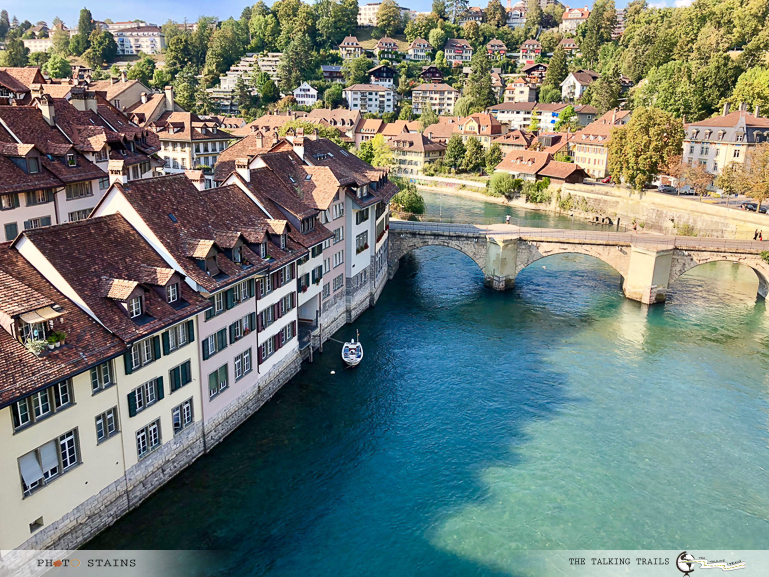 For a country which has likes of Lucerne, Zurich, Geneva – Bern is a charming little city that has preserved medieval vibe, history and views , making it mind-blowingly beautiful. Knowing that Bern is capital city of Switzerland ( how many of you thought it was Zurich , raise your hands 😉 ) I had a certain impression in my mind. I thought it would be a busy city , with cramped up neighborhoods , traffic on the streets and basically too metropolitan to have any Swiss charm to it. On the contrary , Bern turned out to be a living legend of medieval architecture where the old town was motor free ( yes you heard it right , no cars at all ) making it authentic and even more attractive to visit. 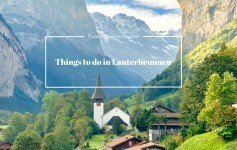 SO if you are in Lucerne or Interlaken , Bern is an excellent option for a day trip and you must include it in your itinerary. 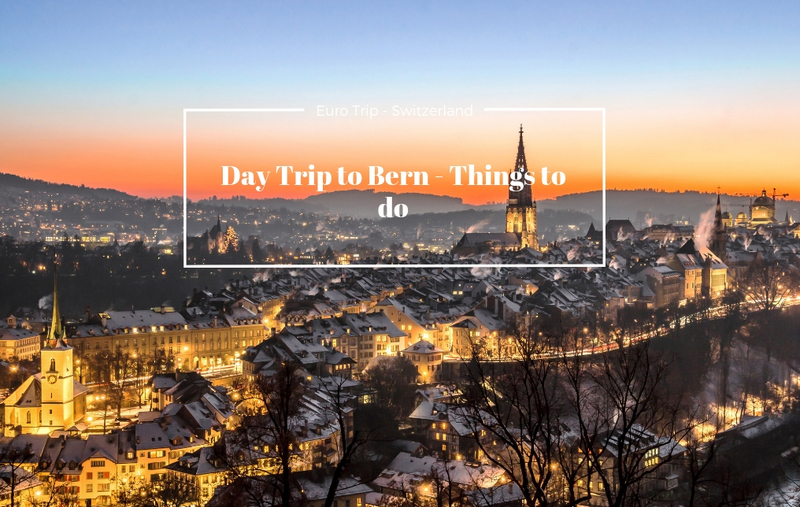 Here is how your Day Trip to Bern – Things to do would look like. 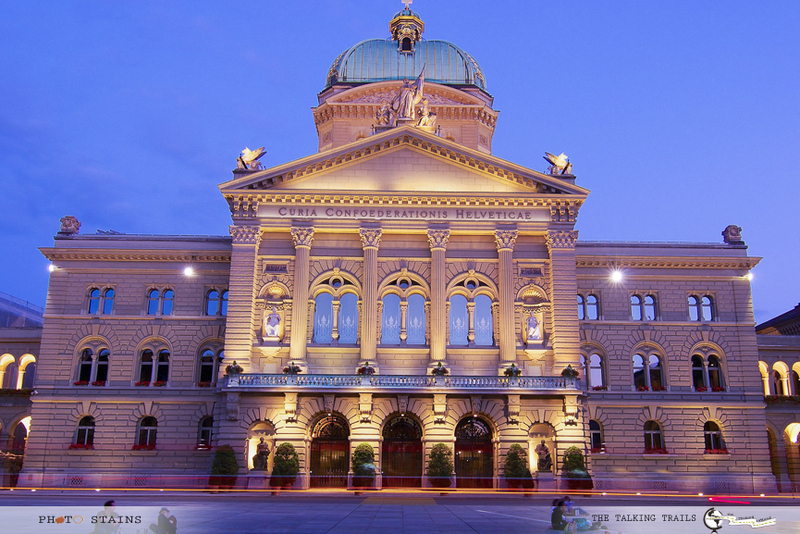 1) If you are staying in Lucerne or Interlaken , Bern can easily be reached by a train ride. I will highly recommend doing this so that you dont have to waste time and money in finding parking. 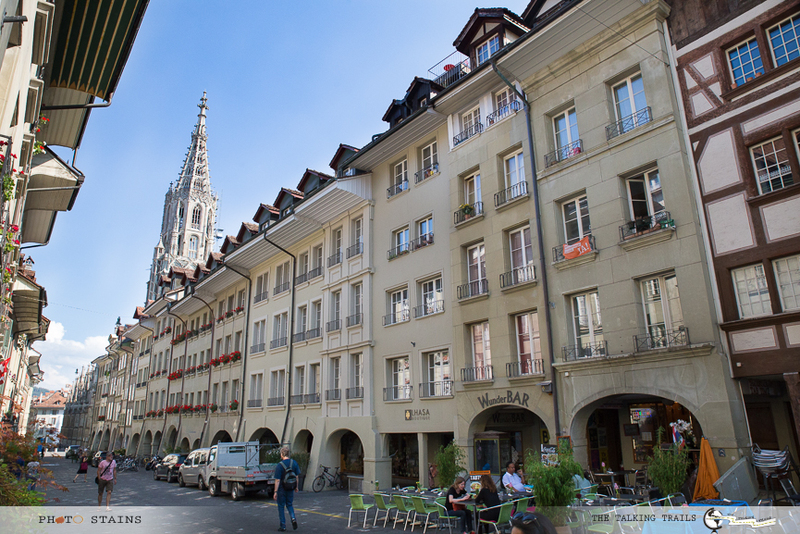 2) But if you still plan to come by car , remember that old city of Bern is motor-free, this means that you will need to park your car either in one of the parking lots in Old city or you can try finding cheap parking across the bridge near Natural History Museum. I will recommend to park your car near old city so that you don’t waste time by walking or trying to find the public commute. 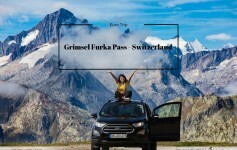 3) If you plan to stay for a night in Bern , you will qualify for a free Bern Ticket, which will provide free use of the public transportation system of the city for the whole duration of stay. 4) Carry cash ( Swiss Francs) with you. Euros are widely accepted but it is recommended to have enough Francs as some hotels and restaurants do not accept other currencies. 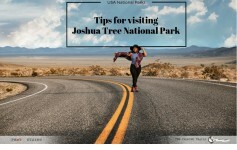 5) Wear good walking shoes and dress in layers if you are visiting in fall season. 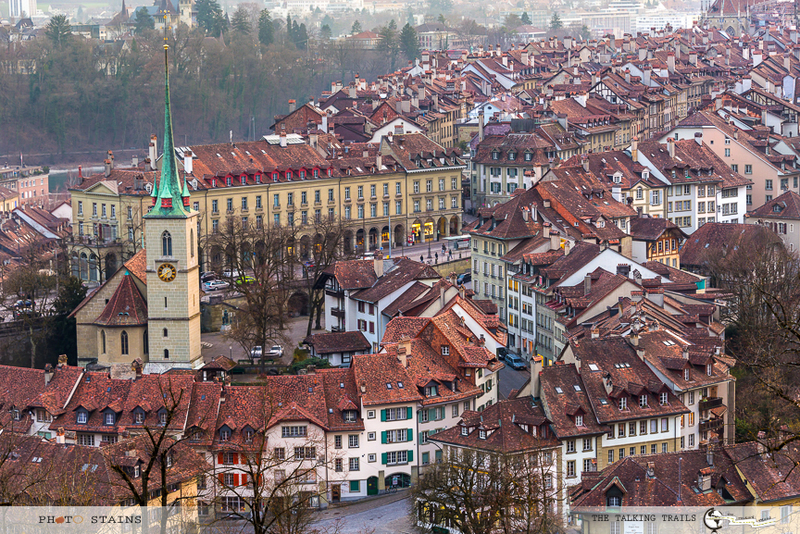 6) A great way to see the main sights of Bern whilst learning about the city’s history is to take a guided tour. You can choose from a 90-minute stroll through the Old Town here, or a 2-hour city walking tour here. Its the old city of Bern is a UNESCO World Heritage Site and you will be spending most of your time in this old vintage quarter of Bern. 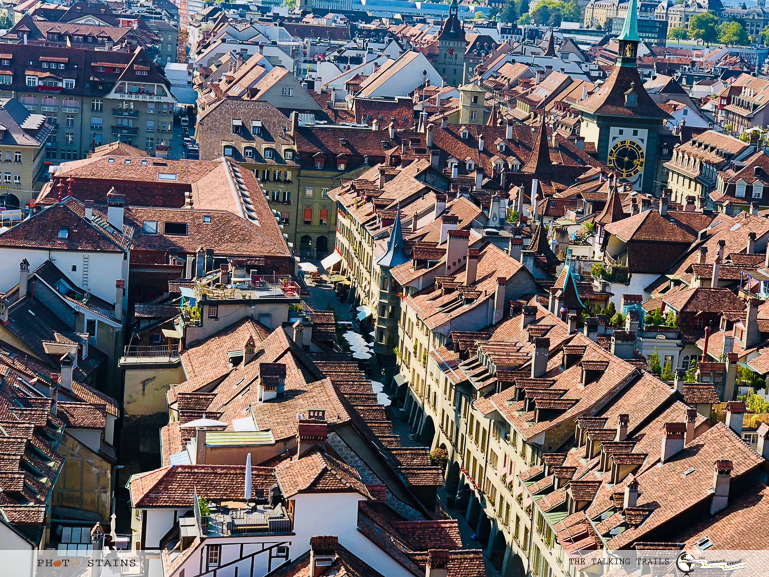 In the middle of old city of Bern is a clock tower , fondly known as Zytglogge. It is a landmark medieval tower in Switzerland that was built in the 13th century.This tower has served the city as a guard tower, prison clock tower and as a public memorial. 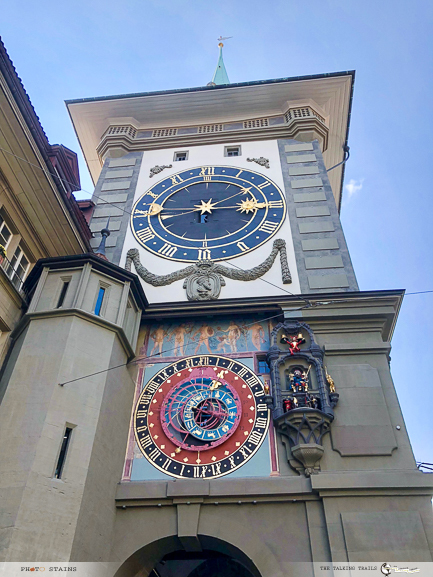 Its famous astronomical calendar clock in the middle was built in 1530s and is considered as one of the oldest watches in Switzerland. The area around the tower always remain very crowded , so its impossible to get yourself and the tower in one frame without any people – so do not even try . If you think Bern looks beautiful from a street view , you must see it from the top of Munster Cathedral. The views are outstanding. The cathedral is the most impressive late Gothic construction in the city which started to build in 1420s and got completed in 1890s. The most impressive part of the cathedral is its 100 meter-high cathedral tower. You will need to climb up around 344 stairs to reach the top of the tower and from there you can enjoy postcard worthy views of the city. From the top of the tower , you can actually see the bend of river Aare and trust me it looks beautiful. Definitely a must do. If I told you , you can see bears right in the heart of city of Bern , will you trust me ? Well , Bear Garden is exactly as its name suggests. Bern has a long history with bears. The history says , Duke Berchtold V von Zähringen killed a bear on the peninsula jetting into the curve of the Aare River and promptly called his new town as Bern, after the German word for bear. So, bears not only give Bern its name, but they also feature on the town emblem and flag. That being said , keeping live bears in concrete pits has been a long tradition of Bern. The new Bärenpark (Bear Park) is much larger and as the name indicates a park rather than a drab, somewhat depressing pit where bears were kept earlier. The new park incorporates the old pits for a total size of around 6,500 square meters. Here you can watch bears in greenery , at times trying to catch fish from the pond and resting in tunnels to avoid annoying humans. 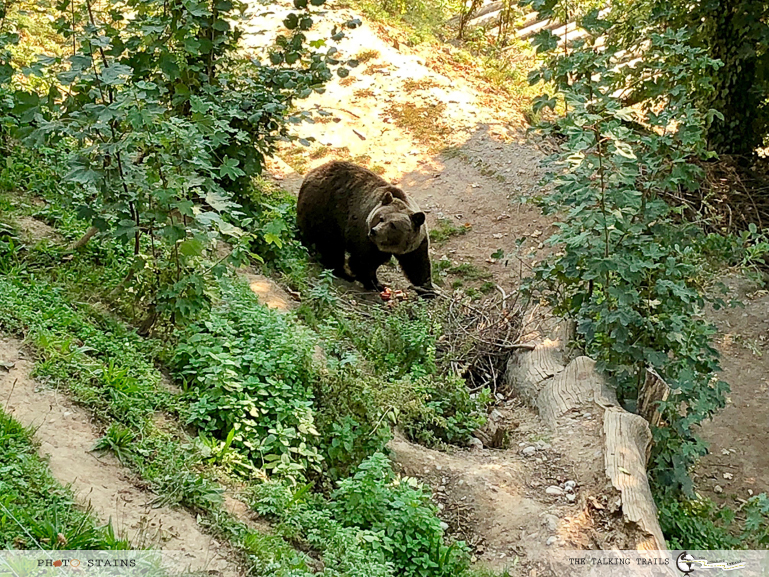 There are 3 bears in the Bear Park named – Bjork , Finn and Ursina. Note : Bear garden is wheelchair friendly and there is no entry fees. It is open 24 hrs , so you can stroll around anytime. I never knew that great scientist Einstein lived in Bern. Yes , located on Kramgasse no. 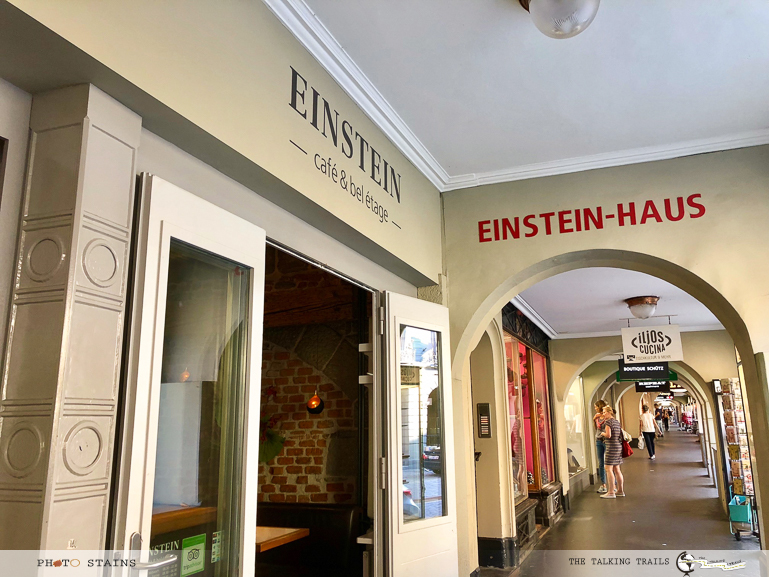 49 in Bern Switzerland , The Einsteinhaus is a museum as well as a former residence of Albert Einstein where he lived with his wife Mileva Maric and their son Hans Einstein from 1903-1905. The Annus Mirabilis papers, which contributed significantly to the theory of relativity, were written down here while he worked at the federal patent office. You can visit this apartment on the third floor of Kramgasse which is furnished in the style of Einstein’s time and gives you insights about his time in Bern . Note : The museum is open 10 – 5 pm and has an entry fees of — 6 CHF(adults), 4.50 CHF (children). Bundeshaus is the swiss Parliament building where Swiss general assembly and the national council convene their meetings. After Bern was declared the Swiss capital in 1848, a new building had to be constructed for its parliament and hence Bundeshaus was constructed. The building is beautiful with its imposing dome clad in copper and golden ribbing.The decorations in and on the Building are the work of a total of 38 artists from all over the country. Recently a Parliament miniature made of bronze was added in Bundesterrase behind the parliament building which vistors are allowed to touch. The parliament square is a very lively place specially in evenings. It serves as a gathering place for young and old and hosts the traditional weekly market. I find it so fascinating that everything in Switzerland – Bern is particular has a story behind it. Rose garden is no exception. It is a cemetery turned into a garden. Yes, from 1765 to 1877, it served as a cemetery for the lower part of the city. It was in 1913 that it got transformed into a park. As the name suggests, the park is most notable for its wealth of blossoms – roses in particular. It is home to 223 rose varities. The park also has a very nice view of the Old Town and Aare Loop. Note : For photography lovers , the best time to visit the park is in the evening during sunset. I am a vegetarian , so of-course my recommendations are based on where you will get ample vegetarian options. 1) Namaste India : Great little restaurant with Indian Cuisine. Food was delicious. 2) Tibits : Located right at Bern train station , this restaurant has some amazing vegetarian and vegan options. 3) Marta : It is a cute little coffee shop with an excellent coffee and home baked cakes and scones. 4) Heir and Jetz : A great vegetarian and vegan take away restaurant with choice of soup , sandwich and pasta. And that is a wrap. Bern really made me think , how all capital cities should be – easy to navigate , less crowded, people friendly and rich in history. All in all I felt that Bern is definitely a must visit city of Switzerland. It may be small, but what it lacks in scenery in terms of mountains etc , it makes it in culture and history. It is definitely worth spending time and appreciating it. Do let me know in comments below , what you found most fascinating thing about Bern. Was it really as you expected? 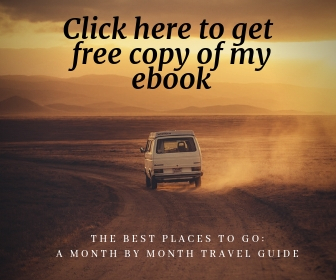 If you need any help in planning your trip to Bern, leave me a comment or email me. I will love to help you out. And again thank you so much for stopping by.